Good. Size: 17 to 19 cm tall (12mo); 1st class post to the UK, Airmail worldwide. Robust packaging. Dispatched, from the UK, within 48 hours of ordering. This book is in good condition but will show signs of previous ownership. Please expect some creasing to the spine and/or minor damage to the cover. Damaged cover. The cover of is slightly damaged for instance a torn or bent corner. Aged book. Tanned pages and age spots, however, this will not interfere with reading. Great book and story. The characters are as close to real as one can make them. i was skeptical at first, having never read a western before, but the writing is wonderful and the story makes it hard to put down. paints an amazing picture of the american west. Larry McMurty is an extremely talented and versatile author. This book is well written and one of the "can't put it down" type that keeps you engrossed to the end. 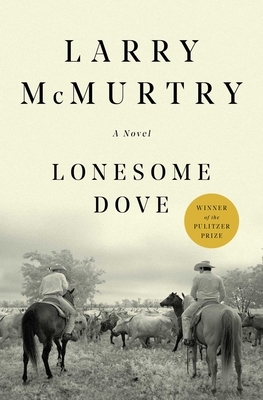 Lonesome Dove is my favorite of all the novels written by McMurty. One of the finest westerns I've ever read. The way the charactors were fleshed out, the story locations, guarentee that it will be read and enjoyed over and over again. Everyone knows a Plulitzer Prize is given to denote good books. In the case of this one it is well deserved IMHO. I could envision the childhood of my own great great grandfather in its pages. I was enchanted by the plot as well as the insights into the psyche of "manly men". You'll enjoy this book even if you have seen the mini-series.